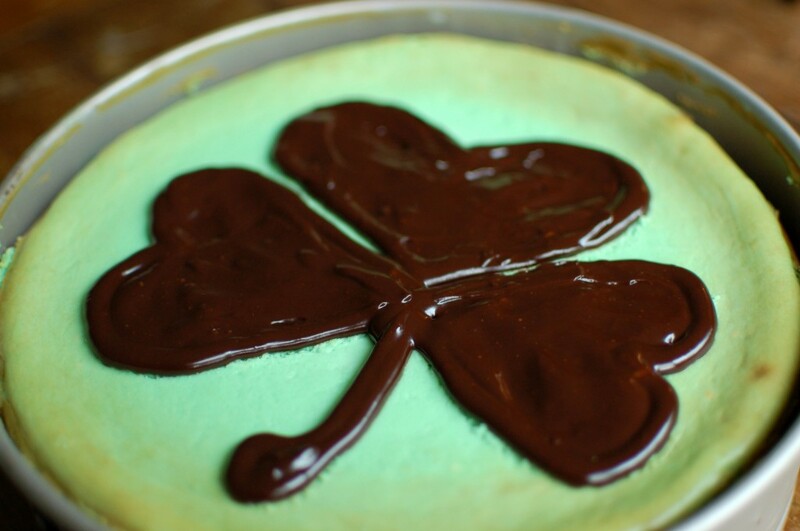 I don’t know when Guinness and Baileys became the official edible representation of St. Patrick’s Day in my mind, but I suspect it was when we hosted our first St. Patrick’s Day party. I struggled to find appealing green or Irish recipes, as I don’t care for vegetables or corned beef and cabbage. (Greg made a great salad that disguised the corned beef and cabbage brilliantly in piles of potatoes, but they still didn’t win my heart.) Besides, how many cute corned beef dishes can you actually make? Instead, I turned to Guinness and Baileys cupcakes, followed by Baileys truffles, Guinness chocolate pudding and now, Baileys cheesecake with Guinness ganache. Irish? Check. Cuter than beef? Double check. Modifying a regular cheesecake to make a Baileys version was actually easier than I expected — I just replaced the milk in our basic cheesecake recipe with Baileys. The Guinness ganache is just a bonus — optional (and delicious) for decorating or drizzling, but not necessary to make the cheesecake shine. Leave plenty of time to prepare this cheesecake. Consider it a glorious make-ahead recipe! The five plus hours that the cheesecake spends in the oven go a long way in preventing cracks. 1. Set out the cream cheese, eggs, sour cream and liqueur and allow to come to room temperature. 2. Preheat oven to 350 degrees. Place a 13 x 9 inch dish of water on one of the lower racks. 3. Grease a 9 inch springform pan. 4. In a medium bowl, mix graham cracker crumbs with melted butter. 5. Press graham cracker mixture onto the bottom of a springform pan. 6. In a large bowl, mix cream cheese with sugar until smooth. 7. Blend Baileys into cream cheese mixture. 8. Add eggs one at a time, mixing just enough to incorporate. 9. Mix in sour cream, vanilla, several drops of food coloring (if using) and flour until smooth. 10. Pour filling into prepared crust. 11. Bake in preheated oven in the middle rack for 1 hour. 12. Turn the oven off, and let cake cool in oven with the door closed for 5 to 6 hours; this prevents cracking. 13. Chill in refrigerator until serving, several hours or overnight. 1. Heat the cream in a small saucepan until it bubbles around the edges. 2. Remove from heat and add the chocolate. Let it rest until the chocolate melts, about 1 minute. 3. Stir until the chocolate is smooth. 4. Heat the Guinness (on stove or in microwave) until warm. 5. Pour the Guinness into the ganache and mix until smooth. Let cool. 6. Pipe design onto cooled cheesecake. 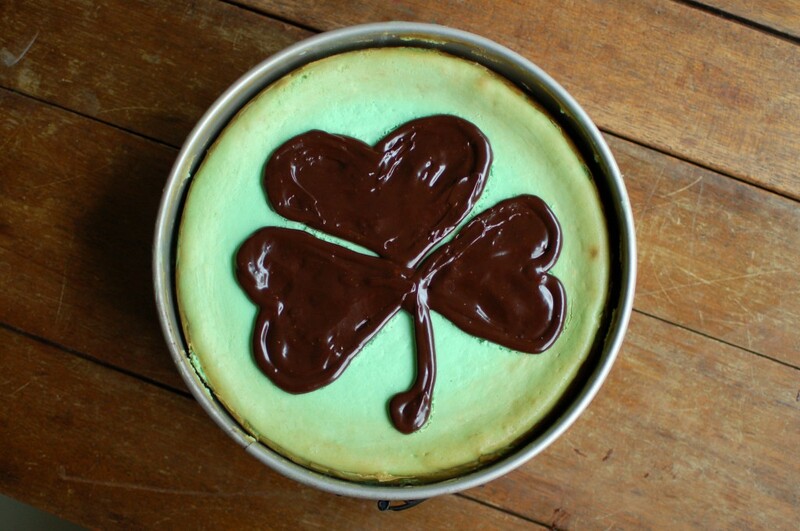 I drew my shamrock on the cheesecake with a skewer before piping and filling in the shape. 7. Enjoy the rest of your Guinness!